The first step in uncovering past atmospheric gas compositions comes from understanding the carbon cycle, which comes with a long-term component, the movement of carbon into, and out of rocks, and a shorter term cycle, the movement of carbon in and out of air, water, and organisms. It is the long-term cycle that most importantly affected the levels of oxygen and carbon dioxide over the past 500 million years. 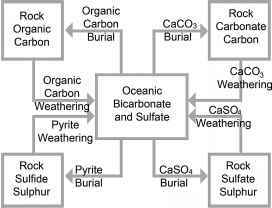 The most important processes affecting levels of oxygen have been the rates of organic carbon burial and weathering. Burning organic carbon-rich minerals or compounds liberates greenhouse gases into the atmosphere, while burying these organic rich compounds has quite another consequence: it causes oxygen levels in the atmosphere to rise. While the process of photosynthesis is producing some oxygen, much of this free oxygen is then destroyed when it combines with the organic compounds and "oxidizes" them, by producing a new compound that has oxygen bound to it. Thus, in times when greater or lesser amounts of reduced carbon compounds are buried, atmospheric oxygen either goes up - or down. Just how much it goes up or down is just now being realized, and we theorize that the consequences of these rises andfall to the history of life have been immense and remain vastly underappreciated as a driver of evolutionary change and the resultant body plans on Earth at any given time. Measuring the amount of oxygen now present in ancient sediments is easily accomplished. But measuring how much oxygen there was in the atmosphere when that sediment was laid down (or when some organism synthesized bone, leaf, or shell) is impossible. There is no magic analysis where some rock or fossil goes into a machine, and out rolls a viable number representing the amount of oxygen in the air of some chosen time long ago. Instead, the best that we can do is estimate the amount of oxygen in the atmosphere from models taking into account many factors, including the net accumulation (or weathering) of organic material. Given an overall increase in burial rates of organic (or reduced) carbon over time, such as coal, atmospheric oxygen levels would have risen. The inputs into these models include the aforementioned rates of burial and weathering of many kinds of rocks, as well as the movement within a second great elemental cycling system on Earth, the sulfur cycle. These and other values, either measured or estimated, have allowed development of various analytical computer models with the goal of arriving at credible estimates of O2 levels at known times. The oldest of these models, called the "GEOCARB" program (Berner, 2004) estimates carbon dioxide, while a derivative of this model called GEOCARBSULF yields both oxygen and carbon dioxide estimates. Of interest here, the GEOCARBSULF model calculates O2 through time. A diagram showing the various inputs and outputs is shown in Figure 2.1. Fig. 2.1 Cartoon to show long-term global cycles of carbon and sulfur over time. Fig. 2.2 Oxygen through time - two different estimates from GEOCARBSULF model outputs (Berner, 2009). The arrow approximates the time of the first dinosaur appearances: 230 million years ago in Madagascar, and 227 million years ago in South America. maxima. It is these three points on the graph that may have had the greatest effect on the history of life. All three are relevant to the discussion of why dinosaurs with their particular body plans evolved. The first of the great nadirs in oxygen levels occurred about 360 Ma, a time when the Devonian mass extinction, one of the five most devastating of all mass extinctions, was playing out. This event may even have been caused by the combination of low oxygen and high global temperatures in the Givetian Stage of the Devonian Period, based on new research by graduate student Kelly Hillbun of the University of Washington. Its relevance to the bird story comes from the effects this downturn may have had on land vertebrate life. 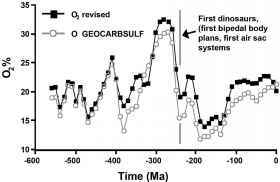 We have previously shown (Ward et al., 2006) that the "conquest" of land by early vertebrates and arthropods was stymied by falling oxygen levels in the Devonian Period. Perhaps originally instigated by what appears to have been the 400 Ma spike in O2 during the Silurian and Early Devonian Periods to levels as much as 26% (compared to the modern day level of 21%), the falling oxygen level beginning in the Middle Devonian was relatively rapid and catastrophic, bottoming out at levels of as little as 13%, or half the levels of only some few millions of years before this bottom. The effect on life was catastrophic (>50% extinction of species) and resulted in what came to be known as "Romer's Gap", a period during the oxygen low when few fossils of either arthropods or land vertebrates are known. Re-diversification only came about tens of millions of years later, in the Carboniferous Period, and once again this diversification appears to have ridden on the wings of rising oxygen. This is the second of the most noticeable aspects of the GEOCARBSULF output. The oxygen high of the Carboniferous had ramifications for terrestrial vertebrates that continue into the present day. It looks as if most clades of amphibians and stem reptiles evolved either immediately before or during the pronounced oxygen high. While data on this are still few, the work of Vandenbrooks (2006) demonstrated that alligators show optimal development when oxygen in rearing chambers was raised to 27%. Both higher and lower O2 levels slowed development. But this time of high oxygen did not last. By the last half of the Permian, oxygen levels began to plummet, with their second major minimum occurring in the Triassic, or perhaps twice in the Triassic, with a slight Mid-Triassic rise in between. In any event, the Late Triassic was a time with low oxygen compared to the modern day. It was also the time when two of the most successful of all clades, the dinosaurs and true mammals, first appear in the record. They appear at the third of the great inflections in the Berner oxygen curve: the late Triassic. The currently oldest known dinosaur fossils come from Madagascar strata dated to 230 Ma. The previously oldest known, and still very old for dinosaurs, was from Argentina, where 227 Ma dinosaur fossils have been found.